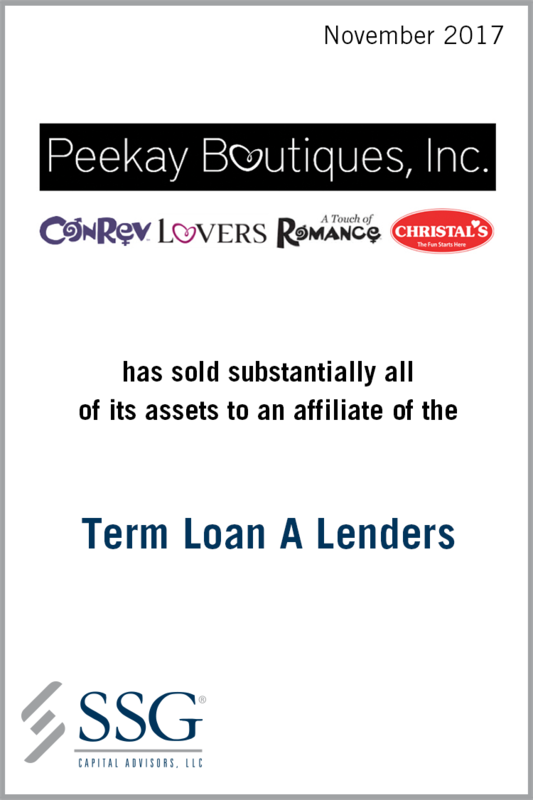 Peekay Boutiques, Inc. (“Peekay” or the “Company”), based in Auburn, Washington, is a leading operator of sexual health and wellness retail locations in the Southern and Western United States. The Company operates over forty stores under four banners including Condom Revolution, Lovers, A Touch of Romance and Christal’s. Peekay’s bespoke retail experience features a curated collection of products designed to promote intimacy and sexual wellness. This personalized experience is facilitated by highly trained and knowledgeable sales associates who educate consumers in a professional, fun and comfortable retail environment. Through a combination of acquisitions and capital investments, the Company developed a profitable and industry leading retail network. However, its acquisitive strategy relied on a highly levered and unsustainable capital structure. The Company engaged in several unsuccessful restructuring initiatives and retained SSG in November 2016 to explore strategic alternatives, including a sale of substantially all of its assets. In August 2017, Peekay filed for Chapter 11 protection in the District of Delaware. SSG conducted a comprehensive marketing process which resulted in a wide range of potential strategic and financial buyers. While significant interest was expressed, the stalking horse credit bid submitted by an affiliate of the Company’s senior secured lenders (the “Term A Lenders”) was determined to be the highest and best price for substantially all of the Company’s assets. SSG’s industry knowledge from prior transactions and experience with efficient Chapter 11 sale processes enabled the Company to maximize the value of the assets.